Bring home this amazing box cabinet to store your jewelry, cookies or any other important things of your choice and it will not fail to impress you. This cabinet box is a smart creation which can be used for various purposes. With curved edges and rectangular in shape, it has four sturdy legs made from wood and the sides and top of mirror. 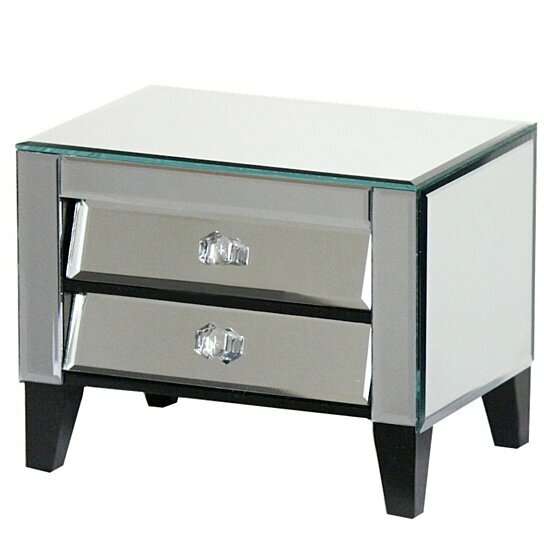 It comes with two pull out drawers with crystal knobs. You can keep it as a side table in the bedroom or near the couch in the living room. This is an stylish multipurpose cabinet. Simple in looks, it offers ample of space for storage.